The Real Estate (Regulation & Development) Bill, 2016 was finally passed by Rajya Sabha today. This is good news for the real estate buyers who have long suffered due to unethical practices of developers and rampant corruption. With the passage of the bill a lot things might improve going forward. 1. Real Estate is state subject which means respective states have power to govern land usage etc. This bill proposes to establish State Real Estate Regulatory Authority as government regulatory authority where the customers can approach redressal of grievances against any builder. 2. After the law is passed by central government, state governments have to adopt the same and then establish the regulatory authority. 3. The bill covers both Residential and Commercial property. Also Read: How builders use super built-up area to deceive home buyers? 4. The projects can only be sold on “Carpet Area” which has been well defined in the bill. Right now builders use Super Area to sell which no one understands and it changes on will and fancies of builder. 5. Builders have to keep 70% of funds collected from buyers in a separate account to cover the cost of construction including that of land. This has been enhanced from 50% as proposed in the original proposal by Select Committee. This would limit builders from investing in land banks for future use and focus on completing the existing projects. 6. All the builders have to register their projects with the State Real Estate Regulatory Authority and disclose all the information like details of promoter, project including schedule of implementation, layout plan, land status, status of approvals, and agreements along with details of real estate agents, among others. 7. This registration would be valid for 3 years with two extensions of a year each. This will pressurize the builder to complete project in 3 to 5 years. 8. No pre launching of projects will be allowed without getting all approvals from the local development or municipal authority and without obtaining registration from the regulator. Also Read: Wrong Maths to Fool Investors! 9. Builders developing more than 500 sq mtrs or 8 apartments have to register their projects with the regulators. This limit has been lowered to bring more projects under its ambit from the earlier bill. 10. The bill covers all the incomplete projects. Subsequently rules would be made for taking care of already completed projects. 11. In case of delay, the builder always had an upper hand. They hardly pay any compensation and if they do its very low while a delay from customers can cost them 18%. The bill proposes to levy same interest rate as builder levies on customers in case of any delay. 12. The builder has to compulsorily give one year after sales service for any defects. 13. The developers would be liable for structural defects from 2 years earlier to 5 years. 14. The project plan cannot be changed without the consent of two third of allottees. 15. Misleading advertisements by builders would be punishable offence where first-time offenders will be fined 10% of project cost and repeat offenders could face jail term. 16. Appellate tribunals will have to adjudicate cases in 60 days and regulatory authorities will have to dispose of complaints in 60 days. 17. Builders can get up to 3 year imprisonment while real estate agents can get up to 1 year imprisonment for any violation of Tribunals and Regulatory Authorities. The above points are just a summary and things can change before the bill becomes law. Since this has to adopted by states further changes is possible from state to state. 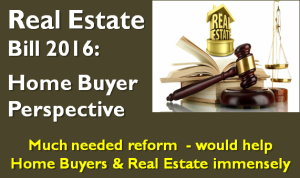 The proposed bill once passed would help home buyers immensely. It would bring transparency in projects, would curb unfair trade practices and one sided agreements. This would also bring down long court cases and give timely delivery. The bill would also benefit genuine developers as this would give enhanced confidence to customers and make real-estate a credible investment destination. However we must remember that just passing a law is not important. Even today there are several laws for customer protection but still such unfair trade practice exists. The idea is to implement the law in spirit and then maybe people can make their lives most costly purchase in peace. 9.4% Reliance Home Finance NCD – Dec 2016 – Should you Invest?